» Nice bike lanes; why so short? Nice bike lanes; why so short? Bike lanes along this newly widened section of Independence Highway are about 5 feet wide. 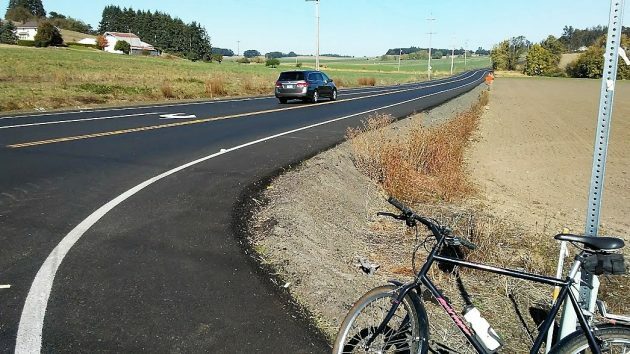 Independence Highway in Benton County has a nice new surface, and a section of the road is wider too, prompting a reader’s question for which the Answer Man hastened to obtain a response. Also, he added, that section was the most cost-effective to engineer and didn’t require buying additional right of way. 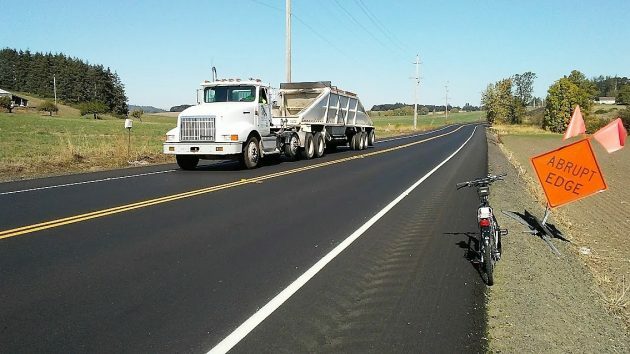 Benton County resurfaced sections of Independence Highway between Highway 20 and Pettibone Road and between Ryals Avenue and Camp Adair Road in 2016. This summer, the section from Pettibone to Ryals got a double chip seal treatment, and the widening from Metge to Ryals — a distance of 3,120 feet according to Google maps — was part of that. The county said it used its share of fuel taxes and dumping fees at the Coffin Buttte landfill to pay for both phases, estimated to total $600,000. North Santiam Paving did the work on both phases. Wheeler didn’t provide a time frame for adding shoulders wide enough for safer bike traffic on the other roads he mentioned, Oak Grove Drive, Metge and Ryals. At one time last year, this was being contemplated as one of the alternatives to an Albany-Corvallis bikeway. The wider section goes north from here, at the corner of Independence and Metge Avenue. Nice improvement! Breathing easier as I take that right corner onto Metge. Typically at a higher than prescribed speed whilst returning from one of my many trips to that “Heart of the Valley” town. btw…How does one pronounce Metge? Pronounced, “met” and “gee” as in the word geese. Hope that helps. Thx for the info, I’ve been wondering what was going on in that part of the woods. Very much appreciate even the hundred feet of smooth road off of Metge going to and from Hwy 20. I have to note the rest of the new shoulders on Independence are kinda bumpy to ride as they do not get the tire traffic.